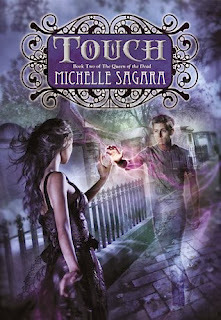 Michelle Sagara is a household name in fantasy- both adult and happily to a lot of readers, now YA. Michelle has been writing for years and her insight and tips are beyond helpful. Please excuse the silly title, it was all me (Alyssa), but when I was reading Michelle's awesome post, it's what popped up into my head. We are so thrilled to have Michelle on the blog today to help her celebrate the release of TOUCH, the second book in The Queen Of The Dead trilogy! I want to talk about doubt, because I wish I had understood it better in my early, stumbling years. I always wrote. When I was a child, I believed that every single book was written by hand. Yes, even duplicates. I was frustrated by my inability to write as if the letters were type - because type, at that time, didn’t exist for me. Some other competent person had perfect handwriting. Some other competent person drew perfect pictures. Some other competent person was an author. In time, I learned about printing presses and publishers. In time I learned that authors did not, in fact, pen every single page of every single book that bore their name. I still wrote. But I was afraid to show anyone else my writing, because I was afraid it was no good. I loved to write. I wrote on an old IBM selectric. I typed single-space, on both sides of each sheet, with almost no margins anywhere, because paper was precious. When I had no intent to publish, writing was an act of imagination and daydream; it was an escape, a private activity. But eventually, eventually, I decided that I wanted to write for other people. Because I loved books. I loved reading. I found solace, escape, freedom, thought, in the pages of books. And I wanted to be part of that. I wanted to write books that moved other readers the way I had always been moved. Which meant: I had to write something Good Enough for All The Readers. I started to write. I loved the idea. I got maybe 25k words into it…and realized that it was No Good. But I had another idea. And I set aside the No Good idea, and worked on the new one instead, because it was better. Except…I got about 25k into that one, and realized it was also No Good. I could have spent decades doing exactly that. I could be doing that right now. Why? Because I’ve never written a book that didn’t fill me, at different times during its writing, with doubt. Not a single book. Meeting other writers, talking to them about their process, I came to understand that this is something that every writer wrestles with. To become a writer, to become a published writer, I had to learn to write through the doubt. I had to push through the certain sense that no one would like this book. I had to understand that the doubt itself was—and is—part of the process of writing a novel. Any novel. So: if you have doubts about the book itself: it’s natural, and you have to learn to work either with it, or around it- I’m proof that you can. 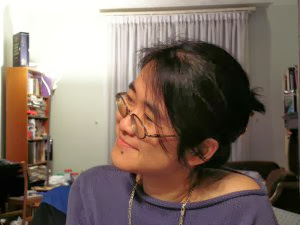 Reading is one of her life-long passions, and she is sometimes paid for her opinions about what she’s read by the venerable Magazine of Fantasy and Science Fiction. No matter how many bookshelves she buys, there is Never Enough Shelf space. Ever. Our stories are pretty similar, Michelle. When I wrote my first book, I wrote it for myself, with no intention of showing it to anyone, or even telling anyone I was writing it. But when I eventually decided to pursue publication, I realized I had to make major, major revisions and "write through the doubt." So your post really resonates with me, especially this passage: "When I had no intent to publish, writing was an act of imagination and daydream; it was an escape, a private activity. Thanks for this beautiful post, Michelle! Loved this post. So great to hear from experienced writers! Terrific post. It certainly speaks to me. I wallow in doubt much of the time. Writing through it is hard, hard, hard. Sometimes I succeed, sometimes I don't. But then there is the next day and I start all over again. Thanks for writing this. Embrace the doubt, yes indeed. Good to know it's normal. ;o) I have my indomitable days and my doubting days. Hopefully they balance out! Wow. What a great reminder that we must push through the doubt. Nice to know we all experience it. By the way, I learned to type on an old Selectric! So timely. After getting NO hits on #pitmad & a rejection email from the one agent I've queried so far - both today - the universe delivers your message to my inbox. Thank you. Fantastic post! Don't let the doubt get you down...or stop you. I had no idea, when starting. I just assumed that every writer whose books I loved had brilliant, perfect ideas that *just worked*. I wanted - so very much - to write books like theirs. Books that *moved* people. But, of course, I was incompetent. Except that’s not the way it worked for *them* either . Catie Murphy once said - and I really wish I could find this, but I can’t, years later, that the difference between a pro and an amateur was simple the ability to *write through the doubt*. It was the ability to take on the fear, and the insecurity, and to *finish the book anyway*. And in my experience, that’s absolutely true. I used to think that when I had gotten good enough, everything would be *easier*. It’s a nice thought - especially if it keeps you going - but in my case, what I discovered was this: it’s not. Yes, the writing *gets better*. But your own ability to see the structural flaws in your work ... also gets better .